Start Your Journey with Passport! 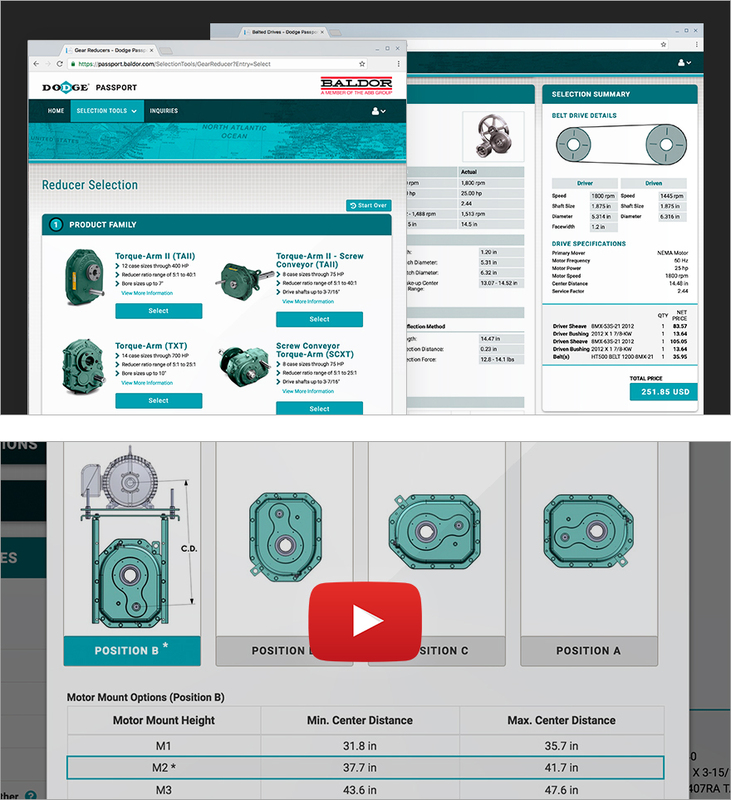 Introducing Passport, a new, easy-to-use selection program for Baldor-Dodge mechanical power transmission products. Passport is a web based tool that utilizes an intuitive process to guide both novice and expert users through quick and accurate selections. During the selection process, Passport offers real time pricing and availability, enabling customers to make cost effective selections of readily available components. After selections are complete, Passport offers add to order capability, seamlessly allowing customers to convert selections into orders via the popular PT Place ecommerce platform. Passport also delivers a comprehensive summary that includes part numbers, supporting technical performance data, and indexes product selections for future reference. Currently, Passport supports selection of shaft mounted reducers, as well as V-Belt and synchronous belted drives. Future Passport capabilities will incorporate additional Baldor-Dodge mechanical power transmission products, as well as offering an application based approach to developing packaged solutions for a wide range of common industrial applications such as conveying and air handling.